The replacement of teeth by implants is usually restricted to patients with completed craniofacial growth. The aim of this literature review is to discuss the use of dental implants in normal growing patients and in patients with ectodermal dysplasia and the influence of maxillary and mandibular skeletal and dental growth on the stability of those implants. It is recommended that while deciding the optimal individual time point of implant insertion, the status of skeletal growth, the degree of hypodontia, and extension of related psychological stress should be taken into account, in addition to the status of existing dentition and dental compliance of a pediatric patient. 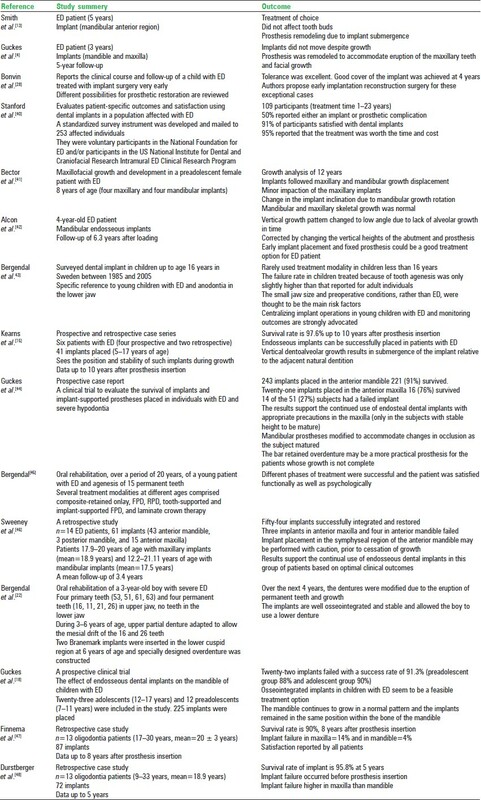 A systematic review of available articles published from 1963 to 2011, obtained from the PubMed database, was done using the terms "Growth," "Children," Dental Implants," Ectodermal dysplasia," and "Oligodontia," which are presented in [Table 1] and [Table 2]. Articles published in languages other than English were excluded. 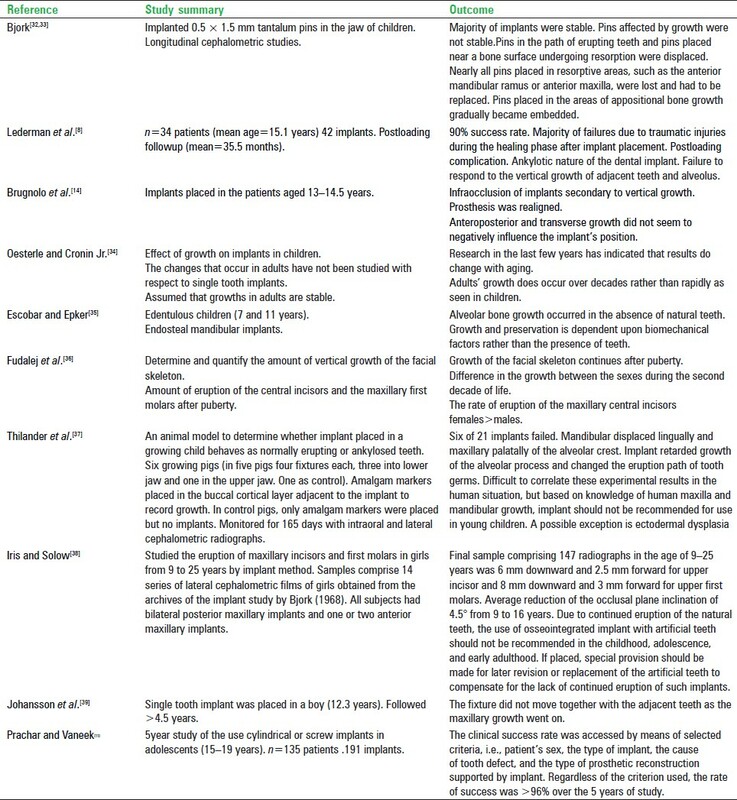 [Table 1] shows the synopsis of studies on growth and its influence on dental implants. [Table 2] shows the synopsis of studies of implant placement in ectodermal dysplasia (ED) and oligodontia patients. Extreme caution must be used in placing implants in children because of growth changes in jaw and the dentition. Maxillary anterior quadrant is an important area for consideration due to traumatic tooth loss and frequent congenital tooth absence. Vertical and anteroposterior growth changes in this area are substantial. The vertical growth of the maxilla exceeds all other dimensions of the growth in this quadrant; therefore premature implant placement can result in the repetitive need to lengthen the transmucosal implant connection which leads to poor implant-to-prosthesis ratios and the potential to load magnification. According to Krant,  the placement of implants in the anterior maxillary quadrant before the age of 15 in female patients and 17 in male patients should be attempted to achieve unique treatment planning goals and with particular emphasis on the only determination of skeletal age, informed consent, and the possibility of future implant replacement. The benefits of implant use in growing patients are as important as the concerns for their premature use. Reports were published by Cronin et al. and Smith et al. documenting the placement of endosseous implants in the anterior mandibular region as early as 5 years of age with positive treatment results. Prachar and Vaneek  present the results of a 5-year study on the use cylindrical or screw implants in adolescents of age 15-19 years. Regardless of the criterion used, the rate of success was always higher than 96% over the 5 years of study, whereas Shaw  reported that the dramatic growth changes occurring in infancy and early childhood were not conducive to the maintenance of implants. Prosthesis remodeling, as stated by Smith et al.,  Brugnolo et al.,  Guckes et al.,  and Kearns et al.,  is an undesirable condition due to the repetitive need to lengthen the transmucosal implant-to-prosthesis ratios and the potential load magnification. According to Dietschi and Schatz  and Mackie and Quayle,  implant placement in children younger than 16-18 years must be avoided. Following the presented case and review of literature by Kramer et al. in their article, they recommended the insertion of implants in those pediatric patients who suffer from extended syndromal hypodontia, such as seen in ED. The most suitable site for insertion seems to be the anterior mandible; insertions in the maxilla should be avoided or at least should not cross the midline. Ryda , established that all clinical judgment and treatment for children should be performed according to the United Nations Convention on the Rights of the Child. Respect the child's development physically as well as psychologically. The timing of implant placement in growing patients was discussed at a Scandinavian Consensus Conference in Sonkoping, Sweden,  where there was a general agreement that implant placement should be postponed until skeletal growth is completed or nearly completed in normal adolescents. In the individual with oligodontia or anodontia, however, earlier intervention could be indicated, especially in the mandible. Anodontia and severe oligodontia were mentioned as exceptions to the rule. Published reports on the use of dental implants in young patients are as yet very limited; long-term clinical studies are necessary for sound conclusions. If the goals of treatment planning favor implant use before skeletal maturation, parents of the child need to be informed about the benefits and possible complications of its use. More emphasis has to be given during prosthesis planning. Still, some children are treated with implants, and there are a few in whom the therapy may result in a better quality of life. However, the treatment can only be justified when the anticipated positive effects are greater than the drawbacks of the procedure. Furthermore, when utilizing techniques that are still not fully evaluated for the purpose intended, as clinicians and scientists, we have a greater responsibility of follow-up and monitoring the outcome. In order to determine the optimal individual time point of implant insertion, the status of skeletal growth, the degree of hypodontia, and extension of related psychological stress should be taken into account in addition to the status of existing dentition and dental compliance of the pediatric patient. 1. Oesterle LJ, Cronin RJ Jr, Ranly D. Maxillary implants and the growing patient. Int J Oral Maxillofac Implants 1993;8:377-87. 2. Cronin RJ Jr, Oesterle LJ. Implants use in growing patients. Dent Clin North Am 1998;42:1-35. 3. Brahmin JS. Dental Implants in Children. Oral Maxillofacial Surg Clin N Am 2005;17:375-81. 4. Guckes AD, Mc Carthy GR, Brahmin J. Use of Endosseous implants in a 3 year old child with ectodermal dysplasia: Case report and 5 year follow up. Pediatr Dent 1997;19:282-5. 5. Fetre-Maia N. Ectodrmal Dysplasia. Hum Hered 1971;21:309. 6. Lowry RB, Robinson GC, Miller JR. Hereditary ectodermal dysplasia: Symptoms, inheritance patterns, differential diagnosis, management. Clin Pediatr (Phila) 1966;5:395-402. 7. Percinoto C, Vieiera AE, Barbieri CM, Melhado FL, Moreira KS. Use of dental implants in children: A litreature review. Quintessence Int 2001;32:381-3. 8. Ledermann PD, Hasell TM, Hefti AF. Osseointegrated dental implants as alternative therapy to bridge construction or orthodontics in the young patients seven years of clinical experience. Pediatr Dent 1993;15:327-33. 9. Kraut RA. Dental implants for children: Creating smilesfor children without teeth. Pract Periodont Aesthet Dent 1996;8:909-13. 10. Cronin RJ, Oesterele LJ, Ranley DM. Mandibular implants and the growing patients. Int J Oral Maxillofac Implants 1994;9:55-62. 11. Prachar P, Vanek J. Tooth defects treated by dental implants in adolescents. Scr Med (Brno) 2003;76:5-8. 12. Shaw WC. Problem of accuracy and reliabiltiy in cephalometric studies with implants in infants with cleft lip and palate. Br J Orthod 1977;4:93-100. 13. Smith RA, Vargervik K, Kearns G, Bosch C, Koumjian J. Placement of an endosseous implants in a growing child with ectodermal dysplasia. Oral Surg Oral Med Oral Pathol 1993;75:669-73. 14. Brugnolo E, Mazzocco C, Cardioli G, Majzoub Z. Clinical and radiographic findings following placement of single tooth implants in young patients. Case reports. Int J Periodont Res Dent 1996;16:421-33. 15. Kearns G, Sharma A, Perott D, Schmidt B, Kaban L, Vargervik K. Placement of endosseous implants in children and adolescents with hereditary ectodermal dysplasia. Oral Surg Oral Med Oral Pathol Oral Radiol Endod 1999;88:5-10. 16. Dietschi D, Schartz JP. Current restorative modalities for young patients with missing anterior teeth. Pediaatr Dent 1997;28:231-40. 17. Mackie IC, Quayle AA. Implants in children. A case report. Endod Dent Traumatol 1993;9:124-6. 18. Guckes AD, Brahim JS, McCarthy GR, Rudy SF, Cooper LF. Using endosseous dental implants for patient with ectodermal dysplasia. J Am Dent Assoc 1991;122:59-62. 19. Bergendal B, Bergendaln T, Hallonsten AL, Koch J, Kvint S. A multidisciplinary approach to oral rehabilitation with osseointegrated implant in children and adolescents with multiple aplasia. Eur J Orthod 1996;18:119-29. 20. Bergendal B, Koch G, Karol J, Wanndahl G, editors. Consensus Conference on Ectodermal Dysplasia with special reference to Dental Treatment. Stockholm, Sweden: Forlagshuset Gothia AB; 1998. 21. Bergendal B. Children with ectodermal dysplasia need early treatment. Spec Care Dent 2002;22:212-3. 22. Bergendal T, Eckerdal O, Hallonsten AL, Koch G, Kurol J, Kvirt S. Osseointegrated implants in the oral habilitation of a boy with ectodermal dysplasia: A case report. Int Dent J 1991;41:149-56. 23. Consensus statement. In: Koch G, Bergendal T, Kvint S, Johansson U, editors. Consensus conference.on Oral Implants In Young Patients. Stockholm, Sweden: Forlagshuset Gothia AB; 1996. p. 125-33. 24. Mehrali MC, Baraoidan M, Cranin AN. Use of endosseous implants in treatment of adolescent trauma patients. NY State Dent J 1994;60:25-9. 25. Kramer FJ, Baethge G, Tschernitschek H. Implants in children with ectodermal dysplasia: A case report and literature review. Clin Oral Iml Res 2007;18:140-6. 26. Ryda U. Children with a needfor extensive oral rehabilitation-Developmental pshychological and ethical aspects. In: Koch G, Bergendal T, Kvint S, Johansson UB, editors. Consensus Conference on Oral Implants in young Patients. Stockholm: Forlagshuset Gothia; 1996. 27. Ryda U. Developmental pshychology-some aspects of normal mental growth. In: Bergendal B, Koch G, Karol J, Wanndahl G, editors. Consensus Conference on Ectodermal Dysplasia with special reference to Dental Treatment. Stockholm: Forlagshuset Gothia; 1998. 28. Bonin B, Saffarzadeh A, Picard A, Levy P, Romieux G, Goga D. Early implant treatment of a child with anhidrotic ectodermal dysplasia. A propos of a case. Rev Stomatol Chir Maxillofac 2001;102:313-8. 29. Bradbury ET, Kay SP, Tighe C, Hewison J. Decision making by parents and children in pediatric hand surgery. Br J Plast Surg 1994;47:324-30. 30. Bergendal B. When should we extract deciduous teeth and place implants in young individuals with tooth agenesis?. J Oral Rehabil 2008;35(suppl 1):55-63. 31. Koch G, Bergendal T, Kvint S, Johansson UB. Consensus Conference on Oral Implants in young Patients. Stockholm: Forlagshuset Gothia; 1996. 32. Bjork A. Growth of the maxilla in three dimensions as revealed radiographically by the implant method. Br J Orthod 1977;4:53-64. 33. Bjork A. Variation in the growth pattern of the human mandible. A longitudinal radiographic study by the implant method. J Dent Res 1963;42:400-11. 34. Oesterle LJ, Cronin RJ Jr. Adult growing, aging and the single-tooth implants. Int J Oral Maxillofac Implants 2000;15:252-60. 35. Escobar V, Epker BN. Alveolar bone growth in response to endosteal implants in two patients with ectodermal dysplasia. Int J Oral Maxillofac Surg 1998;27:445-7. 36. Fudalej P, Kokich VG, Leroux B. Determining the cessation of vertical growth of the craniofacial structures to facilitate placement of single tooth implants. Am J Orthod Dentofacial Orthop 2007;131:59-67. 37. Thilander B, Odman J, Gröndahl K, Lekholm U. Aspects on osseointegrated implants inserted in growing jaws: A biometric and radiographic study in young pig. Eur J Orthod 1992;14:99-109. 38. Iris H, Solow B. Continued eruption of maxillary incisors and first molars in girls from 9 to 25 years, studied by implant method. Eur J Orthod 1996;18:245-56. 39. Johansson G, Palmquist S, Svenson B. Effects of early placement of a single tooth implants. A case report. Clin Oral Implants Res 1994;5:48-51. 40. Stanford CM, Guckes A, Fete M, Sarun S, Richter MK. Perceptions of outcomes of implant therapy in patients with ectodermal dysplasia syndromes. Int J Prosthodont 2008;21:195-200. 41. Bector KB, Bector JP, Keller EE. Growth analysis of a patient with ectodermal dysplasia treated with endosseous implants: A case report. Int J Oral Maxillofac Implants 2001;16:864-74. 42. Alcan T, Basa S, Kargul B. Growth analysis of a patient with ectodermal dysplasia treated with endosseous implants. 6 year follow up. J Oral Rehabil 2006;33:175-82. 43. Bergendal B, Ekman A, Nilsson P. Implant failure in young children with ectodermal dysplasia: A retrospective evaluation of use and outcome of dental implant treatment in children in Sweden. Int J Oral Maxillofac Implants 2008;23:520-4. 44. Guckes AD, Scurria MS, King TS, Mc Carthy GR, Brahmin JS. Prospective clinical trial of dental implants in persons with ectodermal dysplasia. J Prosthet Dent 2002;88:21-5. 45. Bergendal B. Prosthetic habilitation of a young patient with hypohidrotic ectodermal dysplasia and oligodontia. A case report of 20 years of treatment. Int J Prosthodont 2001;14:471-9. 46. Sweeney IP, Ferguson JW, Heggie AA, Lucas JO. Treatment outcomes for adolescent, ectodermal dysplasia patients treated with dental implants. Int J Pediatr Dent 2005;15:241-8. 47. Finnema KJ, Roghoebar GM, Meijer HJ, Vissin KA. Oral rehabilitation with dental Implants in oligodontia patients. Int J Prosthodont 2005;8:203-9.